The complexity of the core promoter transcription machinery has emerged as an additional level of transcription regulation that is used during vertebrate development. Recent studies, including one published in BMC Biology, provide mechanistic insights into how the TATA binding protein (TBP) and its vertebrate-specific paralog TBP2 (TRF3) switch function during the transition from the oocyte to the embryo. Regulation of initiation of transcription by RNA polymerase II (Pol II) is central to any developmental process. A key regulatory step in eukaryotic transcription initiation is the assembly of basal transcription apparatus at the core promoter. This regulatory step has been brought into the spotlight by the discovery of multiple promoter binding factors that assemble into different basal transcription factor complexes. These complexes have to be matched in the future to the diversity of core promoter types and features . This apparent diversity points towards a dynamic regulatory role for this machinery , which is very poorly understood. The preinitiation complex includes the core promoter, Pol II and the general transcription factors TFIIA, B, D, E, F and H. Originally, the core promoter recognition factor TFIID, which is composed of TATA-binding protein (TBP) and 14 TBP-associated factors (TAFs), was thought to be ubiquitous. Functional and genetic studies revealed that TBP is not exclusively required for all protein-coding gene transcription in vertebrates . In line with genetic observations, biochemical analyses revealed the existence of alternative initiation complexes that have been suggested to replace TFIID in several in vivo and in vitro systems [1–3]. The diversity in the components of transcription initiation machinery prompts the questions of why this diversity is present in metazoans and how the various initiation complexes act in parallel in a cell or the multicellular organism. TBP has a crucial role in preinitiation complex assembly: nucleating the binding of TFIID to promoters. However, it is a member of a protein family, and other members of the TBP family, such as TBP-like factor (TLF or TBPL1/TRF2/TRP) and TBP2 (or TRF3/TBPL2), have been shown to substitute for TBP to mediate Pol II and Pol III transcription. TBP2 is a vertebrate-specific paralog of TBP, with much higher similarity to TBP than TLF (TBP2 is about 90% similar to TBP in its core domain). Consistent with this similarity, TBP2 can bind the TATA box, to interact with the other general transcription factors TFIIA and TFIIB and mediate Pol II transcription initiation in vitro, just as TBP can [3, 4]. These properties of TBP2 suggest a function complementary to that of TBP and raise the question of whether TBP and TBP2 are functional equivalents or carry out specialized functions. Thus, given the high level of similarity in biochemical properties between TBP and TBP2, the cause and mechanism for the retention of TBP2 following gene duplication remains to be explained. Two recent publications studying TBP2 function in frogs  and mice  provide some answers to this intriguing problem. The transition from maternal to zygotic gene activation in the embryo has been a tractable and informative model system for studying the function of TBP family proteins in vertebrate ontogeny. Knockdown studies in Xenopus and zebrafish embryos showed that TBP and TBP2 are both indispensable for embryonic development and are both required for activation of zygotic genes [4, 7]. Unexpectedly, TBP2 was shown to have a specialized role restricted to the ventral side of the embryo [4, 7] and in hematopoiesis . However, these results did not shed light on why TBP2 seemed to be mostly expressed in the female gonad in frogs and why only a low level of expression was detected in frog and fish embryos [4, 5, 7]. The apparent enrichment for TBP2 in the female gonad contrasted with opposing dynamics of TBP, suggesting a general feature for specific activity of TBP2 in the ovary in anamniotes [4, 7]. To address the function of TBP2, in their recent BMC Biology paper Akhtar and Veenstra  have investigated the role of TBP2 in oocyte transcription and compared it with that of TBP. They show that Xenopus oocytes lack TBP protein, whereas TBP2 is the major TBP-type factor in the germ cells. Later, in eggs and early embryos, TBP2 levels decrease, whereas TBP starts to accumulate after meiotic maturation and during cleavage stages of development (Figure 1). A major role for TBP2 in oocyte transcription was suggested by the observation that TBP2 is recruited to the transcriptionally active loops of the expanded 'lampbrush' chromosomes found in frog oocytes. The authors  exploited an overexpression system to show that in oocytes TBP2 is recruited to transcribed promoters together with Pol II. In addition, the authors  show that TBP2 is also recruited to Pol III promoters, further suggesting that TBP2 probably replaces TBP in mediating transcription by all three RNA polymerases. Regulation of TBP and TBP2 during oogenesis and the early stages of embryogenesis in vertebrates. Continuous line, frog; dashed line, mouse; red, TBP2; blue, TBP; green, general transcription. Stages are represented at the top by light to dark shading, and at the bottom by schematic representations. At most stages of oogenesis only TBP2 is expressed, which promotes oocyte-specific transcription during these stages. 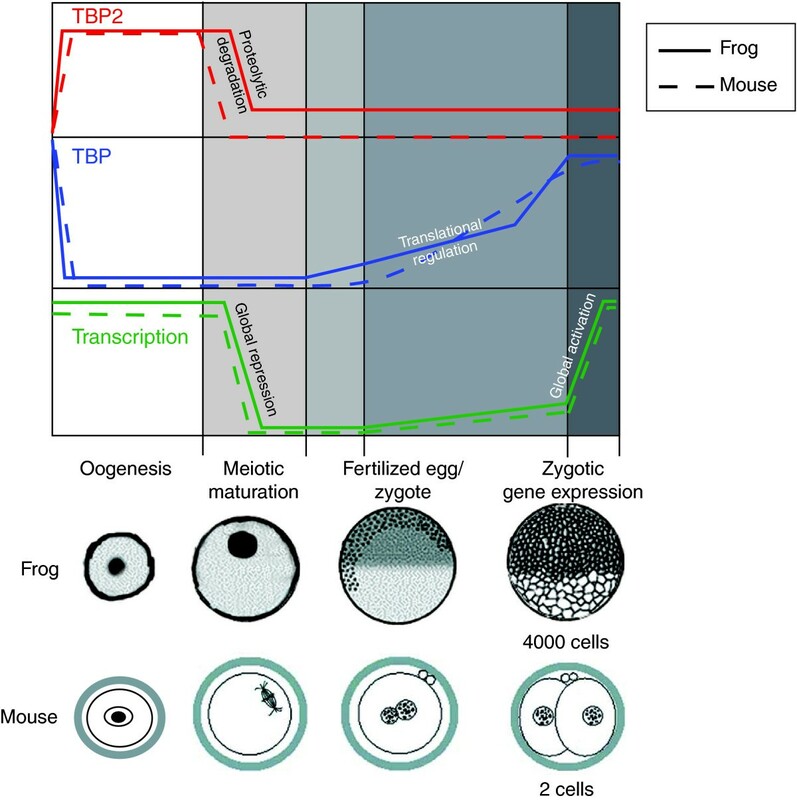 Upon meiotic maturation, TBP2 is actively degraded following global repression of transcription in maturing oocytes (as has been demonstrated in frogs). After fertilization and during the early stages of embryogenesis, TBP expression reaches the maximum levels that are needed to start zygotic transcription. In frogs zygotic transcription is largely delayed until the mid blastula and this process is regulated by late translation of maternal stores of tbp mRNA. In frog (and zebrafish) there are low levels of TBP2 during early stages of embryogenesis, whereas in mice no TBP2 has been detected during embryogenesis. Global zygotic transcription initiation is delayed in both frog and mouse, albeit to different developmental stages, and trace levels of zygotic transcription have been detected in both species before global genome activation. The figure has been generated by summarizing experiments described in [4–7, 9, 10]. The results described by Akhtar and Veenstra  highlight the functional significance of the apparent differentially available pool of TBP and TBP2 in oocytes and provide mechanistic insights into the dynamics of TBP and TBP2 protein. At the end of oocyte maturation TBP2 is degraded and transcription is globally repressed. By analyzing whether TBP2 degradation is directly linked to this change in general transcription, they show  that the repression is established by the germinal vesicle breakdown stage of oocyte development, a stage at which TBP2 degradation has already started but has not reached its maximum. Thus, it seems that it is not TBP2 degradation, but rather a loss of association of TBP2 with promoters, that coincides with transcriptional repression during meiotic maturation. This argues against a direct role for TBP2 degradation in the global shutdown of transcription during oocyte matura tion. This conclusion, together with the observed reduction of TBP2 and enrichment of TBP in embryos, implies that the primary role of TBP2 degradation is to facilitate factor switching and transcriptional regulation during subsequent development (Figure 1). The hypothesis of factor switching during the transition from maternal gene activity is consistent with a series of observations made in several vertebrate models ( and references therein). The picture emerging from the study by Akhtar and Veenstra  is that post-transcriptional regulation of TBP and TBP2 is important for regulating steady-state levels of TBP paralogs in frogs. This regulation results in striking differences in protein availability, and suggests a model for subfunctionalization (division of functions) of TBP paralogs between oocytes and embryos. The conclusions drawn from studies in frog oocytes  match those stemming from expression analysis and recent genetic loss-of-function studies carried out in mice [6, 9, 10]. In mice, the expression of Tbp2 mRNA has been detected specifically in the oocytes [4, 9]. Although there is controversy regarding the specificity of this expression, a recent genetic study indicated that the main role of TBP2 is restricted to the female germline ([3, 10] and references therein). TBP2 protein accumulates in the nuclei of growing mouse oocytes during folliculogenesis, and its level declines on ovulation to become undetectable after fertilization  (Figure 1). In contrast, TBP is expressed in the oocytes only at the beginning of folliculogenesis and after fertilization, but not during oocyte growth  (Figure 1). Consistent with a specific expression in the ovary, Tbp2-/- mice are viable and show no obvious phenotype . However, females lacking TBP2 are sterile as a result of defective folliculogenesis. Tbp2-/- females lack fully grown germinal-vesicle-stage oocytes and Pol II transcription is perturbed mainly at the primary follicle stage, when wild-type oocytes show extensive transcriptional activity. A general decrease in transcription is indicated by the reduced phosphorylation on serine 2 of Pol II and reduced methylation of histone H3 lysine 4, which are markers of active genes. Consequently, a significant number of oocyte-specific genes are severely deregulated in Tbp2-/- females. In agreement with the idea that TBP2 is the sole TBP-type factor in oocytes, TBP is dispensable for correct oocyte maturation and fertilization. In contrast, when TBP2 is misexpressed in early mouse embryos, where it is normally not expressed, it has a negative effect on cell proliferation, leading to developmental arrest . These data together demonstrate that TBP2 is not required for mouse viability but has a critical and specialized role in mammalian female germ cell development, and they provide evidence for non-redundant functions of TBP2 and TBP in vivo in the mouse. The observations from frogs and mice [5, 6] clearly establish TBP2 as an oocyte-specific TBP-type factor in vertebrates. In both organisms during certain stages of oocyte development, TBP is absent and dispensable (Figure 1). Thus, the unique role of TBP2 in oocyte transcription, in a highly specialized cell type, provides evidence that the basal transcription machinery is highly flexible and can switch factors depending on the cellular and ontogenic requirements. A common model for subfunctionalization of TBP and TBP2 during the transition between oocyte and embryo is thus emerging from two evolutionarily distant vertebrates, although there remain important lineage-specific differences between them. In anamniotes, TBP2 proteins mostly (although not completely) degrade before the embryo is formed . In contrast to mammals, a large amount of TBP mRNA is produced maternally and seems to be prevented from being translated in the oocyte and the early embryo. To achieve factor switching, the maternal TBP mRNA translation is activated before global zygotic gene activation to generate an abundant pool of TBP protein, thereby becoming the dominant factor in the embryo. The question remains: why is there a distinct requirement for either of the two TBP paralogs in oocytes and embryos? The high level of divergence of the amino termini between TBP2 and TBP may hold the key to this question. One possibility would be that the amino-terminal domain of TBP2 could determine the association of TBP2 with a special set of TAFs and/or other oocyte-specific factors that, in turn, would confer the oocyte-specific core promoter binding function to a non-canonical TFIID complex. Thus, a specialized TBP2-containing TFIID-like complex could act to mediate transcription from oocyte-specific genes and, in contrast to TBP, could inhibit cell cycle regulatory genes. Alternatively, the amino-terminal domain of TBP2 could function to regulate the DNA binding function of the carboxy-terminal domain, or to regulate protein dynamics, which as suggested by Akhtar and Veenstra  involves regulation of protein degradation. In summary, a protein very similar to TBP seems to have evolved by gene duplication and has a non-redundant regulatory function in transcription initiation in the vertebrate oocyte. Further investigations are required to address how TBP2 functions in the oocyte and what specific properties and molecular mechanisms of transcription initiation distinguish the oocyte from the soma and the embryo. We thank S Bour for the illustration and ME Torres-Padilla for critically reading the manuscript. We apologize to colleagues whose work could not be cited owing to space and reference limitations and was only covered by reviews instead. This work was supported by a EUTRACC grant (LSHG-CT-2007-037445).